Holmenkollen Ski Museum (Norwegian: Skimuseet i Holmenkollen) is located at the base of the Holmenkollen ski jump in Oslo, Norway. The Ski Museum was founded in 1923 and is the world's oldest ski museum. The initiator of the museum was the architect Hjalmar Welhaven. His private collection formed the foundation of the antique and historic skis on display at the museum. Until 1951, the collection was housed in a building in the Oslo neighborhood of Frognerseteren. In connection with the rebuilding of Holmenkollbakken in 1951, the museum collection was moved to new premises at Holmenkollbakken. The museum contains 4,000 years of skiing history, starting with rock carvings dating from the Stone Age. It also displays skiers and skis from the Viking Age. Additionally it displays equipment used in the polar expeditions of both Fridtjof Nansen and Roald Amundsen. The Ski Museum is owned and operated by Skiforeningen. This association is responsible for the organization of sports, activities and events in Holmenkollen National Park. Nice museum of skiing, the lovers of winter activities will enjoy the visit for sure. We went there for the panoramic view of Oslo from the top of the structure. It was a very pleasant sunny day with great visibility. This museum is also included in Oslo Pass list of points of interest. Few minutes drive from the city center. If you have free time, go there spend some time, get few photos. By the way, for the adrenaline addicts there is a great chance to enjoy yourself by fast descend from the top. If you love skiing, like I do, this is definitely worth a visit. Lots of fun history and lore. Once there, a visit to the top of the ski jump is fun too, albeit slow. Check online for hints about best times to to to avoid the line. Easy to get to from downtown with T-banen (city train). 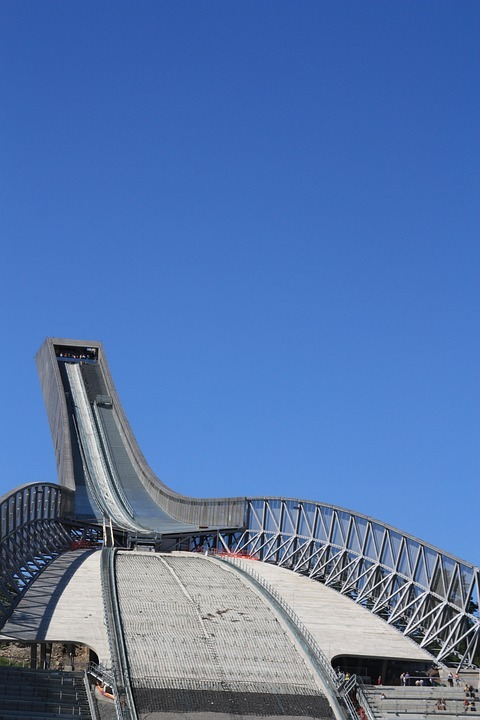 The Holmenkollen Ski Museum as well as tge ski-jump are amazing! Especially for people who haven’t seen a ski-jump in real life or people that have no skiing experience! There is a great museum, explaining the history of the sport and the ski-jump itself! Additionally i’ve added some pictures and one that shows the ski simulator, where they show you a peak of what its like to ski at about 130km/h and also simulate a ski-jump! Its really worth doing and just a fun experience! Lots of interesting information about ski jumping even for a novice. Also other skiing sports included. Elevator and the view from jump tower is a unique experience!